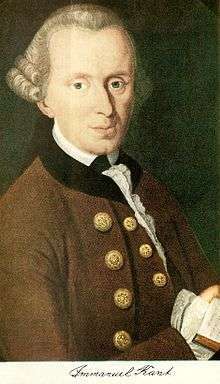 In political philosophy, Kant has had wide and increasing influence with major political philosophers of the late twentieth century. For example John Rawls drew heavily on his inspiration in setting out the basis for a liberal view of political institutions. The nature of Rawls' use of Kant has engendered serious controversy but has demonstrated the vitality of Kantian considerations across a wider range of questions than was once thought plausible. ↑ Kant, Immanuel (1993). Grounding for the Metaphysics of Morals. Translated by James W. Ellington (3rd ed.). Hackett. p. 30. ISBN 0-87220-166-X. ↑ Kant, Immanuel (1993). Grounding for the Metaphysics of Morals. Translated by James W. Ellington (3rd ed.). Hackett. p. 36. ISBN 0-87220-166-X. ↑ Kant, Immanuel (1993). Grounding for the Metaphysics of Morals. Translated by James W. Ellington (3rd ed.). Hackett. p. 43. ISBN 0-87220-166-X.